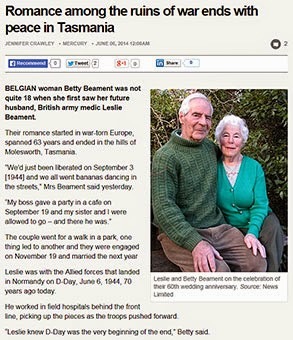 FORMER Derwent Valley Gazette reporter Jenny Crawley has written about the wartime love story of Molesworth's Betty Beament and her late husband Les. Mrs Beament grew up in Belgium during World War II when the country was occupied by the Nazis. Mr Beament was a British Army medic and the pair met following the liberation of Brussels in September 1944. Now widowed, Mrs Beament is well known and held in high regard in the Derwent Valley, not least among the many girls who benefited from her leadership of the Girl Guide movement locally for so many years. Thanks to Betty for sharing her story, which was published in yesterday's issue of the Mercury newspaper and can also be seen online here.